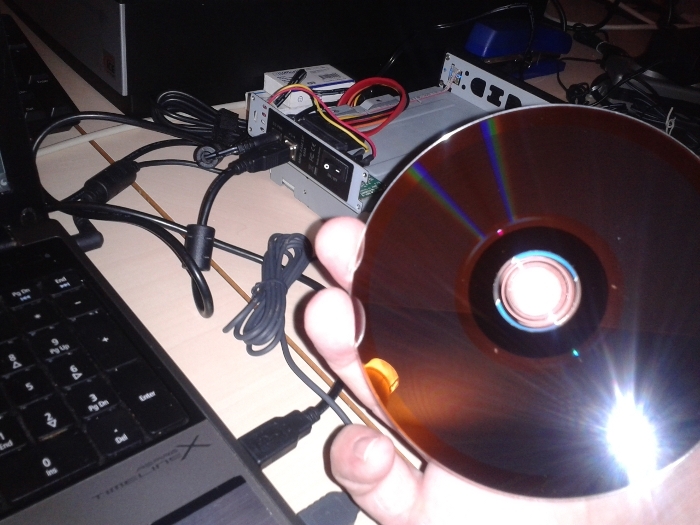 OSS DVD extensions for cdrtools 2.0 is a opensource extension to add DVD support to Jörg Schilling's cdrtools package. A patch for cdrtools-2.0 is created and is actually a translation of a patch which can be found on abcpages.com. That patch is based upon cdrtools 1.11. The patch given here is based upon cdrtools-2.00.tar.gz. The objective is to give cdrtools dvd extensions without imposed limits, and also to have a Open Source solution to burn dvd's. Currently DVD-R, DVD-RW, DVD+RW and DVD+R DL support is added. As a convenience also SRPM and RPM packages for several RPM based Linux distro'sare given. Here's a usefull short HOWTO on setting up and using your CD/DVD writer for the first time, in case you detect problems. For DVD+R see other projects. For instance checkout dvd+rw-tools. I wrote a small HOWTO on how to write SAO/DAO dvd iso's on DVD+R using growisofs. Recently OSS DVD functionality has been expanded with DVD+RW and DVD+R DL burning, with the release of cdrtools-2.01.01a01-ossdvd.patch.bz2. OSS DVD Extensions works perfectly together with k3b, the magnificent swiss army knife burning tool for KDE/Linux. With the recent release of k3b 1.0.3 a new era on the Linux desktop has emerged, as this k3b version makes all these rip/shrink/edit tools on the Microsoft Windows [tm] platform redundant. That is if the DVD recordable is large enough to store the ripped decrypted iso. In fact k3b has gained the same functionality as DVD Decrypter, which as many know, has been banned for download. The OSS DVD Extensions for cdrtools are licensed under the GNU Public License (GPL). See also the Changelog and Disclaimer. All downloads. The patch, SRPMS and RPMS with the extension ossdvd are compliant with the GPL license. They fix the GPL § 2 subclause c requirement as Jörg Schilling pointed out in the DISCLAIMER below. The patch, SRPMS and RPMS with the extension dvd are not. And should thus not be used as such. OSS DVD Extension for cdrtools Changelog. OSS DVD Extension for cdrtools Screenshots. 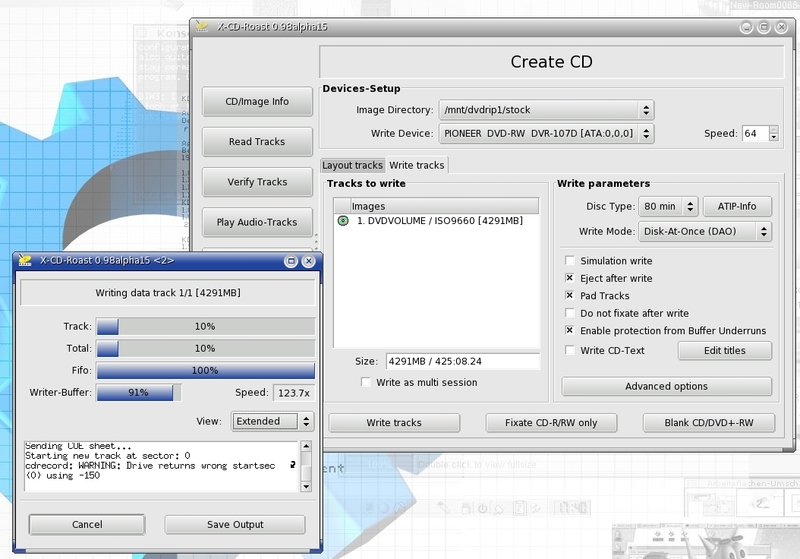 K3B 2.0.2 from Mandriva 2011 can burn Philips BD-RW discs with, amongst other softwares, the OSS DVD extensions for cdrtools. Only mkisofs_ossdvd can not be used as for files sizes exeeding 2Gb on Blue Disc iso images one should make a symlink to genisoimage instead (a iso building tool which is installed on Mandriva 2011 as cdrkit-genisoimage-1.1.11-2-mdv2011). Download for the ossdvd versions is at http://crashrecovery.org/oss-dvd/RPMS/mdv2011/ with a modified dvd+rw-tools-7.1-5mdv_ossdvd-mdv2011 which uses /usr/bin/mkisofs instead of genisoimage. For this BD-RE Writing occasion /usr/bin/mkisofs is then adjusted as a symlink pointing to genisoimage. New patch release cdrtools-2.01a32-ossdvd.patch.bz2 which is adjusted to work with cdrtools-2.01a32.tar.bz2. For Mandrake 10.0 currently (S)RPMS are provided. More (S)RPMS are to follow. New patch release cdrtools-2.01.01a01-ossdvd.patch.bz2 which is adjusted to work with cdrtools-2.01.01a01.tar.bz2. For Mandrake 10.1, Mandriva 2005 LE and CentOS4 currently (S)RPMS Mandrake 10.1, (S)RPMS Mandriva 2005LE aka Mandrake 10.2 and (S)RPMS CentOS 4.x are provided. More (S)RPMS are to follow.